Tangestani, Y., Moatamedy, A., Borjali, A., Sohrabi-Asmarodi, F., Delavar, A. (2018). Prediction of Psychological Disorders Based on Meta-cognitive Components in the Elderly of Tehran. International Journal of Behavioral Sciences, 12(3), 108-113. Yalda Tangestani; Abdollah Moatamedy; Ahmad Borjali; Faramarz Sohrabi-Asmarodi; Ali Delavar. "Prediction of Psychological Disorders Based on Meta-cognitive Components in the Elderly of Tehran". 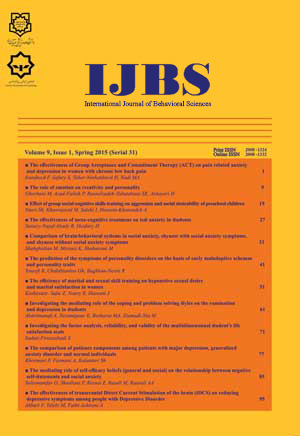 International Journal of Behavioral Sciences, 12, 3, 2018, 108-113. Tangestani, Y., Moatamedy, A., Borjali, A., Sohrabi-Asmarodi, F., Delavar, A. (2018). 'Prediction of Psychological Disorders Based on Meta-cognitive Components in the Elderly of Tehran', International Journal of Behavioral Sciences, 12(3), pp. 108-113. Tangestani, Y., Moatamedy, A., Borjali, A., Sohrabi-Asmarodi, F., Delavar, A. Prediction of Psychological Disorders Based on Meta-cognitive Components in the Elderly of Tehran. International Journal of Behavioral Sciences, 2018; 12(3): 108-113. Introduction: The purpose of this study was to predict disorders in the elderly with respect to psychological disorders. Method: The method used for the research was descriptive correlational analysis. The statistical population of this study included all the Tehran's elderly during 2018, among which 300 were selected by stratified random sampling method. The measurement instruments were the psychological Symptoms Checklist (SCL-90-R) and the Meta-Cognitions Questionnaire of Wells (MCQ). Multiple regression analysis was used as the statistical method to analyze the data. Results: Results revealed that there is a positive and significant relationship between the components of meta-cognition and psychological disorders. The components of positive beliefs, uncontrollable beliefs and cognitive beliefs were significant for all the components of psychological disorders. However, the components of negative beliefs did not have a significant effect on physical complaints and aggression, and the cognitive component had no significant effect on sensitivity in relationships and aggression. Conclusion: According to the findings of this research, it is concluded that metacognitive beliefs play an important role in the prediction of mental disorders in the elderly.